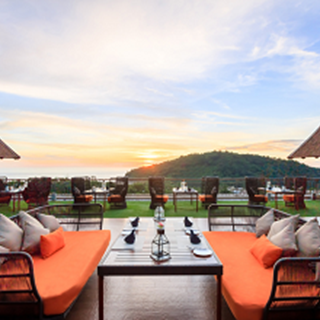 This popular al fresco restaurant has gained quite a following in Phuket. 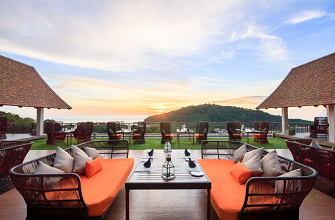 Follow the mouthwatering aromas as far as the rooftop terrace, the highest point in the resort, to enjoy an extra-special meal at Patong’s number one restaurant. As its name suggests, Sizzle specializes in barbecuing prime meats and grilling fresh seafood. Delve into platters of the most succulent shellfish that Pacific Rim waters have to offer. Or indulge your inner carnivore with juicy Black Angus steaks or New Zealand lamb chops, grilled and smoked to perfection by talented chefs. It was an absolute pleasure to dine at Sizzle. The food was beautiful, as was the setting. The staff were friendly, professional and approachable. We will definitely come back during our next visit to Phuket. Thank you for making our night there so special! The rooftop restaurant has a stunning view in the evening when the sun goes down. High quality dinner and a very friendly service. Все осень понравилось. Хорошее меню, неплохая винная карта, очень внимательный персонал. Единственный недостаток, когда село солнце не стало ничего видно в тарелках. Felt disappointed, as it didn’t meet our expectations or even the menu. A lot better restaurants in Phuket for a fraction of the cost. We booked ahead (and had confirmed) yet on the night they didn’t have our booking. Other tables even got given a rose, and we felt forgotten. For the amount of money we paid the menu should be correct, the service should be spot on and we shouldn’t have to pour our own drinks. Great food very friendly waiters but it was almost tow tables occupied. Maybe our time is not the perfect time. The Food, the view, the service! I booked the 6:00 pm table for the amazing sunset and this place did not disappoint. The food and drinks were prepared perfectly, I had no complaints about anything. The staff all spoke English at a high level which I appreciated as my Thai is very limited. It was pricey but worth every penny in my opinion. Restaurant manager was very friendly and accommodating and the service staffs were all attentive. Loved the romantic vibe. Keep up the good work! The staff is very gentle and professional. Well done guys! The service was excellent and the view was 5*. Brilliant. I didn’t like the food choices on the set menu. It’s hard to cater for many but both guests didn’t like any starter or dessert with only 1 main to our liking. The drinks list isn’t very big either. Wine isn’t popular in the island but more than 5 choices or so isn’t great. I didn’t like the vat add and the service charge add. This was added at the end and I wasn’t advised before hand. This left a sour taste on the visit. I felt conned a little. Shame as it was a lovely evening. Amazing staff and service, really great choice of food. The staff are considerate and proactive. They reserved us the best table for our dinner. A beautiful environment and convenient if you are staying at the hotel as we were, however the food was very expensive for what arrived on the table. For a restaurant that markets itself on being about grilled meats, it was also a shame that our ribs were baked, and our asparagus was not grilled. The service was impeccable as it is throughout the hotel.